Sonex Xenos with Flying Tigers paint job... just plane fun! More fun with these... ahh... "kill marks"? 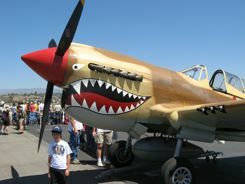 The Flying Tiger "shark mouth" paint job is what you expect to see on a P-40 Warhawk.... This is really the real deal! OK... OK... it's not an antique airplane, but a Flying Tiger wannabe should be included here, don’t you think? When we saw this Xenos painted this way it cracked us up. Definitely a Flying Tigers wannabe. Note the "kills" painted on the side. 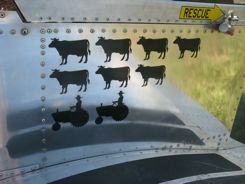 Tractors and cows?? Isn't that just plane fun? 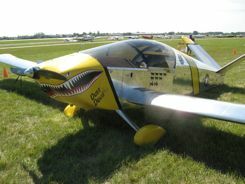 This little Sonex Xenos was in the Homebuilt section in Oshkosh. Apparently it was built in the last few years (in 2008 we think). As we were wandering around Oshkosh, I made Mark take a picture of this one.... I loved the art. P-40 Warhawks are what you expect to see with that "shark mouth" Flying Tigers paint job. 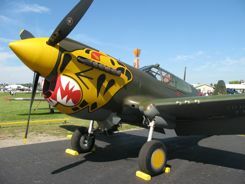 There was a P-40 in the Warbirds section at Oshkosh 2010 that had Aleutian Tiger markings... now that's the real deal. Of course, that's the beauty and fun of Oshkosh AirVenture.... you see a little bit of everything... and whether it's homebuilts or warbirds or antique airplanes, Oshkosh, the people there, and the planes are just plane fun! Join in and write your own page! It's easy to do. How? Simply click here to return to Just Plane Fun!. Find 'em, See 'em, Fly,'em! And have a great flight! Who knows where it will take you? Maybe our readers can give you an answer. An air show you liked. The Orbis Flying Eye Hospital is a MD-10. A one-of-a-kind airplane that flies the world to help people see. How could that not be a favorite airplane? Our 2018 airplane fun includes a little in the air, a little on the ground, a little on tour and… and Oshkosh again. Word from the museum is the primary mission of the Vintage Flying Museum is to preserve America’s flying heritage. They recently Upgraded hangar lighting to help visitors’ experience. We love antique airplanes... and more! Visit us at MouseToursTravels.com too. Travel tips to follow your passions anywhere in the world. Let us be your cyberguides... to antique airplanes and world travel. Copyright © 2009-2018 Antique-Airplanes.com by Mark and Judith F. McEuen All Rights Reserved.